Orofino, Idaho is a land of all seasons, with something for everyone the whole year round. Beautiful mountains, crystal clear rivers, babbling brooks and turquoise lakes surround this cozy town of just over 3,200. Orofino got its start in 1898 due to the inflow of settlers and the construction of the railroad up river. The name Oro Fino means "fine gold" in Spanish. It was taken from a gold rush town called "Oro Fino" that was located near Pierce that later burned down. The post office objected to a two- word name and the town joined the two words and it became Orofino. In 1905, the Idaho State Hospital was opened. 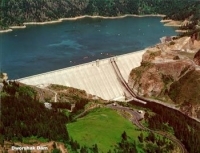 Located four miles northwest of the town of Orofino, Dworshak Dam is a hydroelectric, concrete gravity dam in Clearwater County, Idaho, on the North Fork of the Clearwater River. Originally the name was slated to be "Bruces Eddy," but the name was changed to honor Henry C. Dworshak, a United States Senator from Idaho. The dam is the highest straight-axis concrete dam in the Western Hemisphere, and the 22nd highest dam in the world. Construction began in June 1966, the main structure being completed in 1972, with the generators coming online in 1973. The generating capacity of the dam is 400 megawatts, with an overload capacity of 460 MW. Dworshak Dam is part of the Columbia River Basin system of dams. Dworshak Reservoir, is formed behind the dam, stretching 53 miles upstream. The North Fork of the Clearwater River, runs 2 miles downstream from the base of the dam, until it joins the South Fork of the Clearwater to form the Clearwater, which flows to the Snake River at Lewiston. Dworshak Dam Visitor Center is located at the top of the dam, and is open daily from 10 a.m. to 4 p.m. Exhibits highlight the history and wildlife of the area. Tours are also available through the interior of the dam. Dworshak reservoir is easily the least used body of water in the state. Over 54 miles in length, with over 100 mini-camps, it's a great place to fish or just get away from it all. Best known for its Kokanee salmon and Smallmouth bass, currently it holds the state record for the largest smallie, at a whopping 8 1/2 pounds! With close to 250 miles of shoreline, you can leave your worries about being cramped or disturbed at home, there is plenty of room here even in the busiest of seasons. Truly this man made lake is an anglers paradise with a variety of fish species to test your skills against! Since time immemorial, the Nimiipuu (or Nez Perce) have lived among the rivers, canyons and prairies of the inland northwest. The proud Nez Perce are still here and you can experience the story of a people who are still part of this beautiful landscape. Nez Perce National Historical Park includes a number of historical and cultural exhibits for your enjoyment. You can visit sites that Captains Meriwether Lewis and William Clark passed through or camped at on their journey across western Montana and central Idaho like the Lolo trail and Pass where you can retrace the route that Lewis and Clark took in 1805 and 1806. Don’t miss the opportunity to steep yourself in the rich history of this region! C. C. Fuller and his company, the Clearwater Improvement Co., plotted a portion of his homestead, creating the town of Orofino in 1898. This land was orginally part of the Nez Perce Indian Reservation that was opened to homesteading in 1895. Settlement of the town started in earnest in 1899 when the railroad was built to the town, bringing settlers. The present town is the second one to bear the name Orofino. The first settlement, Oro Fino City, located two miles south of Pierce, was created during the gold rush of 1861. The town succumbed to fire and the land was dredged thirty years before the settlement of the current town. The name, originally spelled Oro Fino, means "fine gold" in spanish. The spelling of Orofino was adopted when the post office objected to two word names. The village was Incorporated in 1905 with a population of 207 people. Half of those were under the age of 18. At the beginning, Orofino was located in Shoshone County. 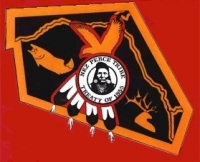 Later, it became part of Nez Perce County when the south end of Shoshone County was annexed. In 1911, Clearwater County was created with Orofino as the county seat. Orofino suffered another fire in 1906 with the lower town from Canada Hill to the Orofino Creek burning. The State Hospital started construction in 1905 with much of the labor being completed by patients brought from the hospital at Blackfoot. The town experienced fairly rapid growth in the early 1900's. A new school was erected around 1910. This school still stands as the base of the middle school. Orofino served as the hub for the largely agricultural area. The timber industry also played a part in the economy, although it was mainly composed of temporary sawmills. When the railroad completed a spur line from Orofino to Headquarters, located north of Pierce, the logging industry became a major employer of the area. The Staff of The Real Estaters, llc would like to welcome you to Orofino and invite you to visit again.